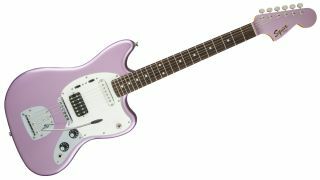 The Jarman bros, longtime fans of offset Fender guitars and basses, have taken a leaf out of former collaborator Johnny Marr's book and landed themselves a signature model each, thanks to Squier. Ryan Jarman's Signature Guitar - interestingly, there's no model designation here - mashes together a host of body shapes, producing something in between a Jagstang and Mustang. A short 24" scale length is paired with a Duncan Designed Jaguar single coil in the neck and a high-output humbucker in the bridge, controlled via phase and on/off switches for each pickup, plus master volume and tone controls. Scenesters will also love the stunning Burgundy Mist finish, vintage-style Jazzmaster bridge, large '60s-style headstock and metal control plate. Gary Jarman's Signature Bass - again, no model name - goes for a P-Bass meets Jazz Bass vibe, sporting the P-Bass split-coil middle pickup and original headstock plus Jazz Bass control knobs. Elsewhere, the bass offers a 32" scale length, HiMass bridge with three vintage-style brass saddles, a metal control plate and natty Ocean Turquoise finish. The Ryan Jarman Signature Guitar and Gary Jarman Signature Bass will be available from September for £345 and £330 respectively.